Are you missing teeth? Millions of Americans are missing some or all of their teeth and therefore require dentures. Dentures are one of the most common dental treatments to replace some or all teeth missing in the mouth. Pelican Landing Dental offers several different denture treatments. If you would like to learn more about the different types of dentures, feel free to read below. If you have any specific questions, feel free to contact us any time! There are several different types of dentures. We will begin by discussing the similarities and differences between each type. When you think of dentures, it is likely that you are thinking of complete dentures. A complete denture is used for patients that have lost all of their teeth in the upper and/or lower jaw. A complete denture is made of a gum colored hard acrylic base holding either porcelain or acrylic teeth. The result often cannot be distinguished from naturally healthy teeth. Complete dentures are held in place largely by the tissues in the mouth. An upper denture is retained in part by a suction created with the soft tissues of the palate. Often patients have teeth that are hopeless and therefore require a denture. Many patients are unable to or unwilling to have a healing period prior to denture delivery where they are missing all of their teeth. In these situations, immediate dentures can be created. The fabrication of immediate dentures consists of removal of some of the teeth in the mouth (often those in the back of the mouth preserving the visible teeth) followed by a period of healing. In the meantime the dentures are fabricated. The custom dentures are then delivered on the same day the front teeth are removed. With this procedure, patients do not have any period of time without visible teeth in the mouth. Partial dentures are used when there are one or more teeth missing in the mouth. While variations exist, a partial denture is generally fabricated of a metal framework with a gum colored acrylic base and denture teeth. Partial dentures are held in place mostly by metal clasps that essentially hook onto existing teeth in the mouth. Some patients have lost significant amounts of bone after teeth have been lost. Others have different anatomical difficulties with soft tissue and musculature. In these cases, a complete denture may not stay in the mouth sufficiently. In these cases, dental implants can be used to assist in retention of a denture. When overdenture treatment has been planned, several implants will be placed in the upper or lower jaw. After a period of healing and bone growth between the implant and the jaw, the underside of a denture is altered so that the denture can snap onto the implants. The result is a reduction of slipping, sliding, and dislodgment of the denture. Hybrid dentures are an amazing treatment option. A hybrid denture is for the patient without any teeth in one or both of the arches that wants the most stable long-term option. A hybrid denture is a denture with specific attachments designed to screw onto several implants. Professional cleanings are required for hybrid denture patients usually at 3 or 4 month intervals. Hybrid dentures correct many of the deficiencies of the other denture treatments. Because they are fixed they do not slip, slide, rock, or dislodge. 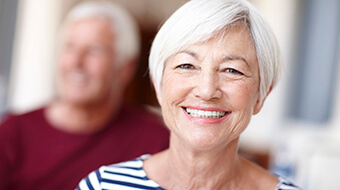 Patients who have obtained hybrid denture treatment report excellent levels of satisfaction.